Billy is so excited to meet new family member Isabelle that he’ll do absolutely anything to get a peek at her. bless it’s heart help it up there…. I don’t know about the kid, but Billy’ll sleep good tonight. at least Billy got his cardio today. I think pup needs to share to sleep with newborn baby AWW So cute….. I think he’s on a little doggy trampoline! so cute! little pup will wear himself out with all of that jumping! i say help him up there poor little thing. Wow, that was a good workout! He sure did get some good exercise, and we hope his intentions were all good. 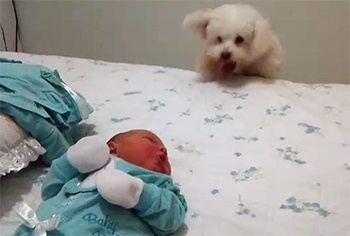 Mom says humans always need to be very careful with dogs around babies. aww, i would hold him up there to see her….so cute! I’m exhausted… The baby was sure red, maybe she was exercising something herself?